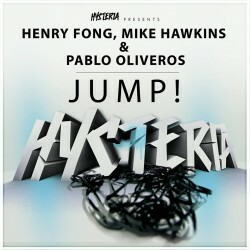 Henry Fong, Mike Hawkins, Pablo Oliveros – "JUMP!" With a slew of huge successes this year, Hysteria Records adds another to their list with Henry Fong, Mike Hawkins and Pablo Oliveros' track, "JUMP!". The Danish/American collaboration already has received massive support from none other than Tommy Trash, Hardwell, and Thomas Gold, as well as the label's owners, Bingo Players, of course. Interestingly enough, the three artists finished "JUMP!" almost a year ago after being introduced to each other through a blog that had posted on their separate songs. As Fong states, "We wanted to do a fun bouncy track instead of a full on death banger, and were inspired by some of the moombahton/trap sounds." Though I'm pretty sure any release on Hysteria must contain some banger qualities, the brightness of the track shines through a triumphant melody that calls out over the climbs before reforming into a skipping line after the drop. Add to this some snare effects along with a strobing synth and you can definitely see the inspiration Fong speaks about. Currently Fong is in the midst of his Jumpstart Tour with remaining shows in Florida, New York, and New Jersey. As for Hawkins and Oliveros, keep an ear out for their upcoming track, "Bangover", out on August 8th off Spinnin Records. A-Trak and Phantoms revamp Bingo Players's "Cry (Just A Little)"